Archbishop of Canterbury, Justin Welby, Friday, paid a personal visit to President Muhammadu Buhari at Abuja House, London. Archbishop and President Buhari are friends, who share deep respect for each other. 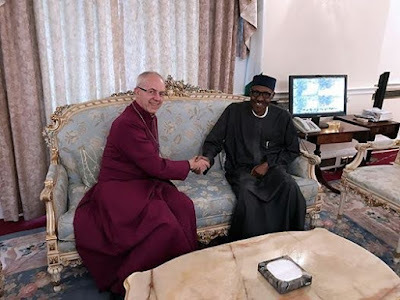 Archbishop Welby said he was delighted to see the rapid recovery President Buhari has made from his health challenges, noting that it was a testimony to the healing powers of God, and answer to prayers of millions of people round the world. The cleric pledged to continue praying for both President Buhari and Nigeria. In his response, the Nigerian President thanked Archbishop Welby, whom he noted had always stood by him at critical times, and wished him God's continued grace in his spiritual duty of leading the Anglican Communion worldwide. 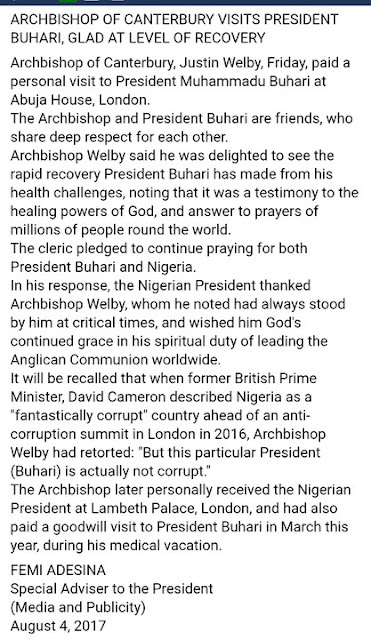 It will be recalled that when former British Prime Minister, David Cameron described Nigeria as a "fantastically corrupt" country ahead of an anti-corruption summit in London in 2016, Archbishop Welby had retorted: "But this particular President (Buhari) is actually not corrupt." The Archbishop later personally received the Nigerian President at Lambeth Palace, London, and had also paid a goodwill visit to President Buhari in March this year, during his medical vacation.